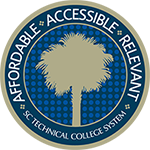 Each year the System educates and trains over 175,000 South Carolinians through credit programs (109,815) and continuing education programs (64,712). Our colleges are strategically located across the state with nearly every South Carolinian within a 30-minute drive of one of our 16 main campuses or 64 satellite campuses. Our colleges offer a variety programs in South Carolina’s high-demand, high-paying fields, including 77 degrees, 28 diplomas and nearly 1,100 certificate programs. Our colleges provide one of the most accurate pictures of a community in terms of its population, its demographic makeup and its business and industry focus. 52% of all South Carolinians enrolled as undergraduates in South Carolina's public higher education attends one of our 16 colleges. Average annual tuition at one of our colleges is 34% of the average annual tuition at a four-year institution. Our colleges remain South Carolina’s most affordable path to a quality higher education. 95% of our students are South Carolina residents. The vast majority of our students are citizens of the state and choose to live and work in South Carolina after completing their education. 90% of our graduates are placed in a job related to their field of study or are continuing their studies and furthering their education.